Estimated reading time: 4.9 mins. Painting the Web by Shelly Powers is not the type of book I would normally pick up. Having 14 years web design experience means that you tend to have absorbed something in the way of use of graphics on the web, from raster images, to Scalable Vector Graphics (SVG), which is what this book is all about. 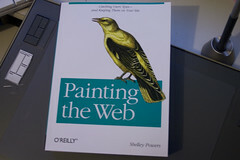 Looking at this book from its title alone, I first thought, Painting the Web was a book on SVG. But I was wrong, well partly wrong. Shelly, takes you through what makes up the graphics on the web now and into the future in a chatty friendly manner, however this book can be a touch dry when it comes to technical explanations. It moves through image and colour theory onto a review of professional to budget applications both desktop and online. The book presents a no nonsense explanation of the software. It also supplies a few how to recipes on the building of raster graphics for the web. A good third of the book is dedicated to the use of vector graphics on the web. Dealing with X3D, VRML (now that brings back memories), VML, SVG (noting it’s restrictive browser implementation). I was expecting maybe a little discussion on desktop vector applications, but instead there is comprehensive introduction on SVG. It’s not just a few pages folks, this goes from the simple to complex examples. There is also a good overview of the SVG tools and editors in the marketplace to round it off. There is a small section looking at CSS. Now this is not meant to be a primer, it assumes you know your CSS, and I’ll assume you do. The book looks at the more advanced elements of CSS 2, not bad if you’re not using all the browser compliant elements already. It runs us through concepts such as pseudo-elements, specificity and styling microformats. Like with Raster graphics there are a number of CSS recipes as well. For me this is where the book slips up a little; if we are uber CSS designers then we should know all the basics that she explains such as layered background, conditional statements, font unit resets, unordered list menus. There is a section on the principles of good design, as well, detailing how to layout a good semantic web page, be that static or via a flexible layout grid. One small point on the microformats front, a footnote reference to the microformats wiki would have been a nicety, it’s not a biggie, something to consider for the 2nd edition. There is also no explanation what microformats are and how they are used. Slap on the wrist to the technical editor. There is a interesting exploration into the realm of the canvas and it’s extension into the use with SVG. This book explains the creation of simple objects and their comparison to SVG, to the use of canvas effects and transformations. The canvas element is one of those under used elements that I can see getting a greater use in the near future. Overall it’s not a bad book, like I said previously, not something I would pick up, but I’m a little jaded on the subject and looking for the edge. Still the sections on SVG and the canvas where informative. However, the book could do with the gleam of a good technical editor, there are sections of the book that I was wincing over, not that they are technically wrong. It was just the sequence of the chapters and the information therein, a little too much on digital imagery and photographic aspects for my liking for instance. This with some of the disjointed sections it tended to give me the impression that the book was all over the place not really knowing what it wanted to be, graphics, CSS, AJAX, SVG, Canvas or design overview; it does it all. A little streamlining and this could have been a better book. That said if you want a good comprehensive overview on the graphical elements of the web, especially SVG at 600+ pages, Painting the Web, by Shelly Powers is a good place to start.